They have emerged out of hibernation and descended upon a small fishing village in Massachusetts Bay. Once again, it’s Bear Week in Provincetown. Out of all the theme weeks, Bear Week is a favorite among locals. The bears, despite their rough and rugged exteriors, are the jolliest. They are less neurotic than the Circuit Boys (too much haughty preening and calorie counting) and more festive than the broods of Family Week (children). Hairy, stocky, and bearded, they have made the annual pilgrimage, waving a banner of orange and brown, a paw print emblazoned in the top left corner. This week, we live in the Bear Flag Republic. The great ursine appetite is a significant trait in the Bear community. “Being a Bear is an attitude,” explains Don from Brooklyn, who counts this as his eleventh annual jubilee. “It’s more relaxed, more accepting, and less body conscious.” I noticed Bears are quite fond of parading around shirtless, their vast, fuzzy bellies bulging over cargo shorts. “It’s a pride thing.” Of course, one need not be a total grizzly to fit in. There are Otters (hairless bears) and Cubs (diminutive bears). When I asked what he believes to be the best part of Bear Week, Don looked at me dumbfounded, because I had asked the most obvious question in the world: “The scenery!” Duh! Bear Week is more than a feast for the eyes, but also for the senses. The line for Tea Dance, a favorite crepuscular Bear activity, stretches blocks down the street, as the Boat Slip ticks past capacity around five p.m. Bears tend to occupy a greater surface area on the dance floor. Throbbing bass beats pulsed at Classic Disco Night at the A-House through a thick mélange of fuzz and sweat as the Bears danced the night away. The balance of hyper masculinity- some of these guys look like body builders recently released from prison- with pop diva flourish was dizzying and delightful. The cloud of body odor emanating from the dance floor was dizzyingly pungent. 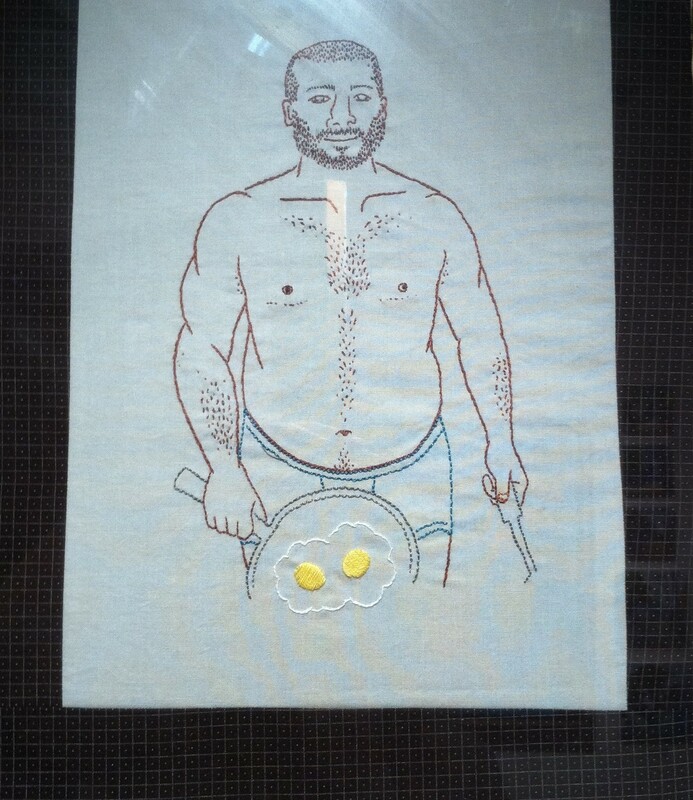 I popped inside, and while I admired Rebecca Levi’s whimsically sweet embroidery sampler of a bear in his underpants preparing eggs sunnyside up, I witnessed no such interactive opportunity. I walked back outside, basking in the providence of such an homage. A large man followed behind me. “Here he is!,” strapping ice cream guy exclaimed, thrusting his cup of melting pistachio in my direction. “You can feed the bear!” It turned out he was playing a practical joke, as he urged me, a total stranger, to spoon-feed his unassuming boyfriend. It was weird, but I did it. And the boyfriend, puzzled, let me. He was a total Teddy Bear. Elizabeth Greenwood is from Worcester, Massachusetts. As a New York City Teaching Fellow, she taught English as a Second Language in the Bronx and Manhattan. 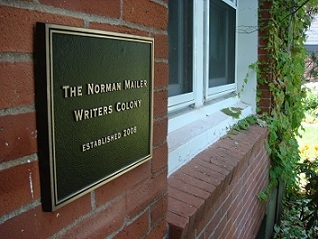 Writing on culture, her work has appeared in The Atlantic and The New Yorker. She is working toward an MFA in literary nonfiction at Columbia University, where she teaches undergraduate writing. Visit her blog. Elizabeth is also a Mailer Nonfiction Fellow. She is using her month of residency to write about people who fake their own deaths, which is her current obsession.